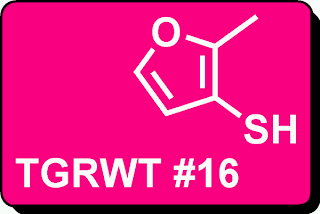 Markus at Supernova Condensate has posted the invitation to join in on episode #16 of "They go really well together" (TGRWT). The idea is that foods with one or more flavour compounds in common will taste well in combination; the concept of flavour pairing. This months ingredients are chicken and rose. 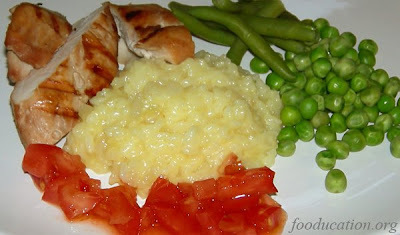 The risotto and tomato salsa was based on a modified recipe found at egg.no (English translation). The foodpairing scheme for rose indicates that rose should match well with tomato (strong correlation) and soy sauce (weak correlation), in addition to a weak correlation with chicken. Unfortunately, I couldn't find any asparagus, as this is also indicated to be a good match with rose and might go well with the risotto and chicken. I simply went for green peas and asparagus beans. The chicken fillets was slashed and left in soy sauce to marinate for 8 hours (two fillets with sweet soy sauce and two in salt). The fillets were put in plastic bags and immersed in a pot with water, cooked "approximately-sous-vide" (65-69 °C) for 2 hours. They were fried quickly just before serving. The salsa was made simply by chopping tomatoes and mixing with the chilli sauce (didn't bother skinning the tomatoes, since much of the umami flavour sits is in the skin and seeds :). I won't give a detailed description of how the risotto was made. I simply followed a typical risotto procedure found in most standard cookbooks. The rose water was stirred in at the end of the process. I wanted just a hint of rose, and combining saffron and rose might give a distinctive Persian touch to the risotto. At least, that was the idea, and I didn't want the rose to dominate as it easily will if it's not used with care. An appropriate Norwegian name for this dish might be "Ros og ris", a phrase for giving feedback/response; "praise & smack". (Important: See the last set of comments for a critique which possibly requires some major revision to the text and figures). If just a little amount of water finds its way into melting chocolate, it goes all grainy and solid - it seizes/curdles. There is really no fix to the problem. However, if some more water is added, the chocolate suddenly becomes fluid again. How come? In three recent posts in the Swedish food blog Matmolekyler ("Food molecules"), Malin discusses the physics of chocolate. In the third one, the question arose on what really happens when a little water makes the chocolate go all grainy, and why adding some more water solves the problem. It made me start looking around in my "standard" food literature base: Corriher, McGee, Belitz/Grosch/Shieberle, Barham, Pedersen, Dahlgren. Although Corriher came closest, none of them had the answer to Malin's question: "is there an oil-in-water emulsion going on or something?". Finally, Beckett did have the answer, maybe not very surprising, since the name of the book is "The Science of Chocolate". However, it took some serious searching even in this book in addition to a few research papers. Hence, I expect to write a couple of more posts on chocolate since I've dug into the topic. Chocolate seems like no easy medium to work with, and according to books on the topic I have to follow loads of specific directions in order to avoid failing. I've postponed it in fear of failing. The solution to the problem: start by failing on purpose! In fact, so little water is needed for this to happen that steam from a boiling pan might be enough to make the chocolate go grainy. When this happens, there is no way back to the pure chocolate. However, it is perfectly usable for other purposes such as chocolate sauce, ganache, drinking cocoa etc. Alternatives to using water bath or a double boiler principle. In stead of water bath or double boiler, I usually use the microwave or even melt the chocolate directly in the pot using low heat and stirring continuously (have to be very careful). However, I love sabotage experiments. When recipes tell me by all means not to do something, the little boy awakens and I go for it. And that's the point in this post: what happens when chocolate seizes? Chocolate is a dispersion, consisting of solids distributed in a fatty (continuous) phase. It contains miniscule cocoa particles (mean diameter ca. 0.016 mm) and sugar particles too small for our tongue to notice them as grainy when properly distributed. The sugar is hydrophilic (water loving), and repelled by the fat. An important function of the lecithin emulsifier is to build protecting layers around the sugar particles so that they don't separate from the fatty phase and give a grainy texture. The emulsifier is commonly lecithin (lecithin is also a natural constituent of egg yolk, and the main reason for why the yolk doesn't split into a fatty and a watery phase). What happens when water gets into the chocolate? In it's solid form, pure chocolate is a relatively stable system virtually free of water (0.5-1.5% by weight). When the chocolate is melted, the stable dispersion is challenged. If just a small amount of water (or steam) finds its way into the chocolate, the water molecules form droplets, since they don't want to mingle with the fat. 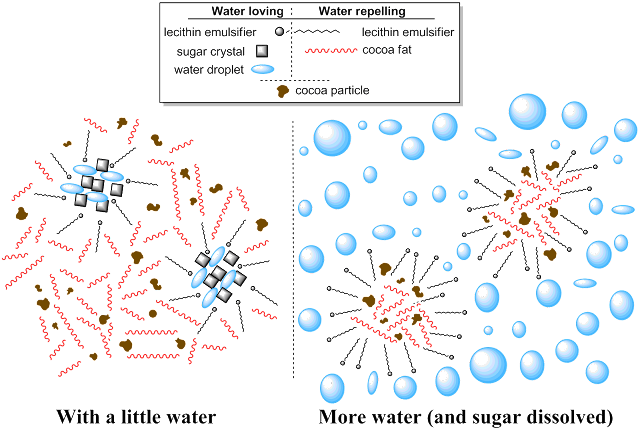 Since water and sugar like to mingle, the sugar particles are wetted by the water. The result is "the sugar bowl effect", just as when a few drops of water are spilled into a sugar bowl. The tiny sugar particles in the chocolate become moist and cling together giving larger lumps (agglomerates). The result is an inhomogeneous mixture between these sugar agglomerates and the cocoa fat mixture. These won't mix evenly because the sugar has gone watery (the lecithin is probably not capable of stabilising such large amounts of hydrophilic constituents). Since sugar is a major ingredient in chocolate, it all goes grainy. A water content of 3-4% by weight is enough to make the chocolate seize. Since the chocolate might contain som water already the critical amount of added water might be as low as 1.5% by weight (1/3 teaspoon on 100 g, ref. Afoakwa et al.). A definite explanation of this was in fact rather difficult to find, and the only literature source stating this explicitly was in fact Beckett's book (The Science of Chocolate. Afoakwe also states this, but refers to Beckett's book). He writes that about 20% by weight water vs. chocolate is needed to achieve such a phase inversion, whereas Corriher writes that you need a minimum of 1 tablespoon water per 56 g (2 oz) chocolate. This roughly equals 30% 20% by weight. Note that this is total amount of water; if cream, butter or some other water-containing ingredient is used, this contribution counts. Since chocolate contain plenty of emulsifiers, this emulsion might be quite stable and a good starting point to many wondrous things such as drinking cocoa, chocolate sauce, ganache/truffles, foam/mousse ("chocolate chantilly") or even a chocolate mayonnaise. 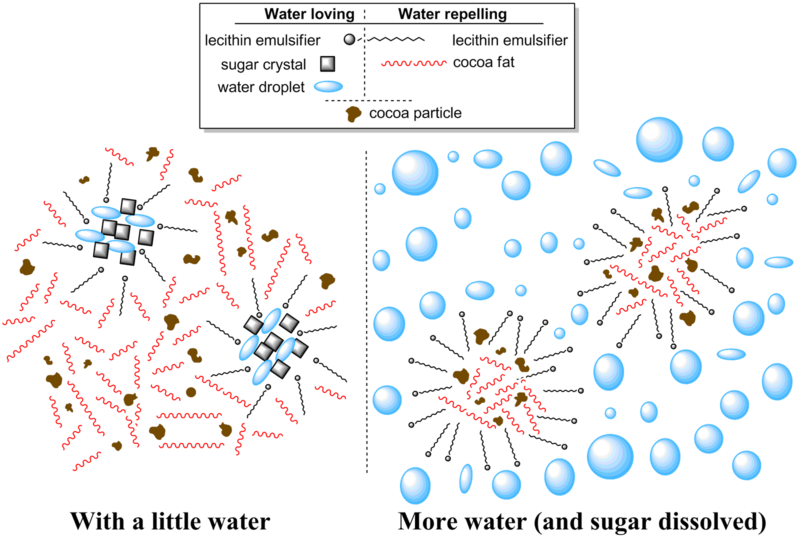 *Note: Some sources (Rowat et al., 2011, and these ppt slides by Naveen Sinha) state that the cocoa particles are hydrophilic (water loving) and that the emulsifier surrounds these rather than (or just as much) as the sugar particles. I have not been able to confirm this and have thus drawn it as neither water loving or water repelling. 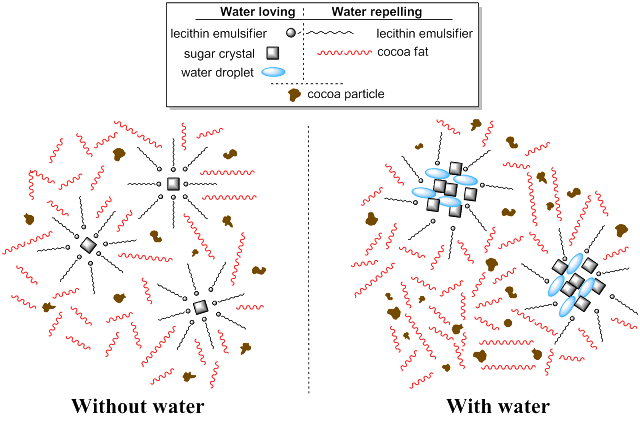 However, I've found a couple of papers stating that the cocoa particles in fact contain fat (points towards water repelling, see Do et al., 2011) and that the emulsifier primarily attaches itself to the sugar particles (Vernier cited in Svanberg et al., 2011). Afoakwa, Paterson & Fowler: "Factors influencing rheological and textural qualities in chocolate - a review". Trends Food Sci. Tech., 2007, 290-298. Do, Vieira, Hargreaves, Mitchell & Wolf: "Structural characteristics of cocoa particles and their effect on the viscosity of reduced fat chocolate". LWT - Food Sci. Tech., 2011, 44, 1207-1211. 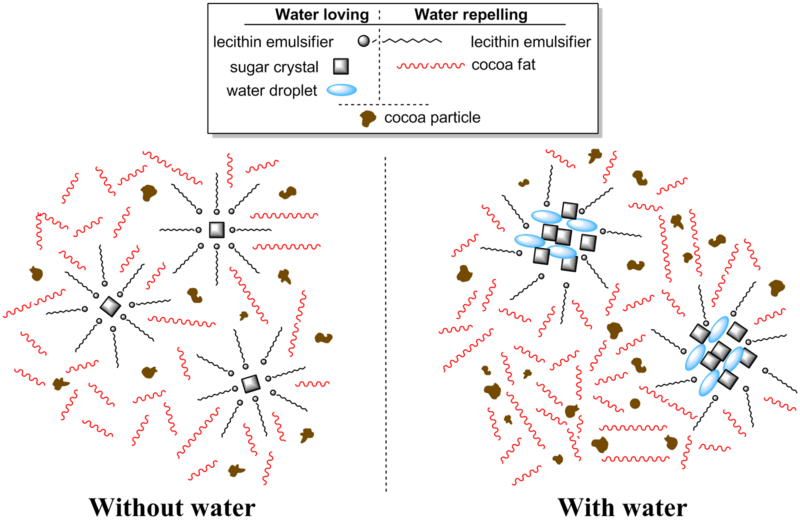 Svanberg, Ahrné, Lorén & Windhab: "Effect of sugar, cocoa particles and lecithin on cocoa butter crystallisation in seeded and non-seeded chocolate model systems". J. Food Eng., 2011, 104, 70-80. Beckett: The Science of Chocolate (1. ed.). Cambridge : Royal Society of Chemistry 2000. Dahlgren, Ö.: Laga mat - hur man gör och varför. Stockholm : Liber utbildning, 1994. Corriher, S.: Cookwise. New York: William Morrow 1997. Pedersen, T.: Kemien bag gastronomien. Copenhagen: Nyt Nordisk Forlag 2005.